62 Brookwood Road; 3BR/3BA; $2550/mo. Stunning North Asheville 3BR/3.5BA brick Georgian executive home on hillside near Country Club of Asheville. A fourth BR has been converted into an exquisite walk-in closet. BAs are updated. 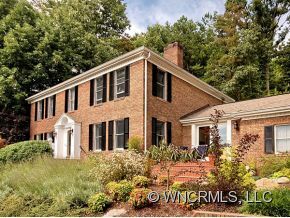 LR has HW floors and FP; formal dining room; eat-in kitchen w/ breakfast bar, range/frig/dw/disp; cozy library. Finished basement w/ tons of storage. Central heat/AC w/ heat pump. Dbl-car garage on main level. Front and back porches, patio, winter view. Incredible family home. Asheville City Schools. Small pets OK w/ prior approval and pet fees. Directions: North on Merrimon Ave, right on Wembly to Asheville Country Club; bear left onto Windsor. Bear right onto Robinhood, bear right onto Brookwood to #62 on left (NO yard sign). 35 Robindale Avenue; 2BR/1BA; $1,365/mo. Charming one-story cottage in Annandale neighborhood in North Asheville. Dining room, living room with fireplace, hardwood floors, vinyl floors in kitchen and bath. Large deck, A/C, washer and dryer connections. Pets okay on approval and with pet fees. Lawn maintenance is included. Asheville City Schools. Directions: Merrimon Avenue north, right on Annandale Avenue, left on Robindale, house is on the right.